usually distal fragment displaces into extension. Proximal metaphyseal fragment occludes the volar subchondral fossa and blocks IP flexion. evaluate finger cascade with flexion. Any overlaps of injured digits indicates need for reduction +/- fixation. 0.045 (1.1mm) K-wires generally used. 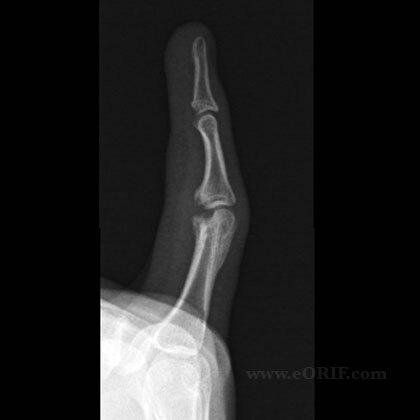 Consider 0.062in(1.6mm) for larger bones(metacarpal); 0.035in(0.9mm) for smaller bones (pediatric fx). Closed reduction under c-arm guidance. one or more intramedullary or two crossed K-wires. K-wires must not cross at the fracture site. Flexion Contracture: see Hogan CJ, JAAOS 2006;14:524.